The Chihuly Collection in St. Petersburg opens officially today and I was fortunate to attend a preview for the press yesterday. Chihuly himself was scheduled to lead the press tour but unfortunately, his health prevented him from being there. In his place, the tour was lead by Chihuly's friend and project architect Alberto Alfonso. The Chihuly Collection in St. Petersburg is presented by The Morean Arts Center and it's the world's first permanent Chihuly installation, and Alfonso's brilliantly, thoughtfully designed space reflects the fact that this collection is here for keeps. The facility and the art interact perfectly and the impact of both is magnified exponentially. Chihuly's best known for his work in glass, but he works on paper and neon as well. 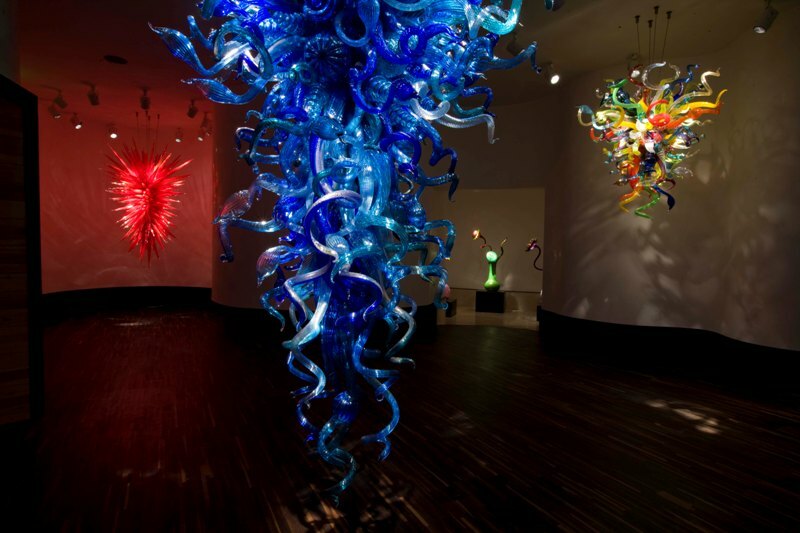 There are installations in all three of his media in the collection and the combination of the three in one space fleshes out he vision and talent of an artist who practically invented the studio glass movement. Because I attended a press preview, the collection staff hadn't erected all of the barriers and velvet ropes that will protect Chihuly's work when the public are welcomed in today. I was granted a once in a lifetime opportunity to see this work close up, barrier-free. It bordered on the unsettling to walk around ten feet tall, suspended chandeliers with a value I'd be afraid to calculate. What a thrill! The collection starts in the street with a Chihuly sculpture that pays homage to the iconic tower of The Vinoy Hotel in the background. In no real order, here are some of the works on display. St. Petersburg's Chihuly Collection opens today and you can find out about operating hours, ticket prices and information about how to get here and where to stay on The Chihuly Collection's website. His work is breathtaking! These pictures are stunning . . . thanks for sharing your private tour with us! Thanks! Most of what I do I do to be able to blog about it later. That's not too big a stretch. Beautiful works! This collection has most definitely earned its spot on my itinerary for my next trip to FL. Back in VT (where I hail from originally), I lived very near to the glassblowers of Young Constantin & Associates in Shelburne Falls, MA. I have always loved their pieces and watching them work in the shop attached to the gallery. Strange how an art form so ethereal and transcendent can remind one of home! Cham: When you get here, there's a hot shop associated with this collection adn it's located at the main Morean Arts Center. If you plan ahead you can take a class. George: Thanks! I was milling around that collection all day yesterday cursing the fact that I don't have a decent camera. You cannot imagine what it was like to walk all around those chandeliers. It was nerve wracking frankly. I was so paranoid about getting distracted and tripping! 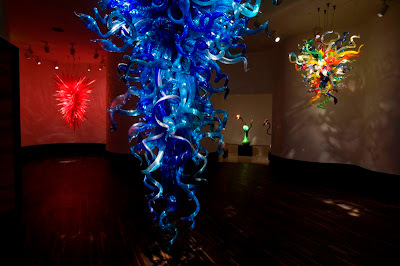 Chihuly will be here in October and I'll get an audience with him then. I would give up a limb to own the light piece in the last picture. You'll have to visit your in-laws this winter. That neon sculpture hangs over a travertine floor with a mirror shine. The neon reflects in the floor perfectly and it's an amazing effect made all the more dramatic because the sculpture hangs in a small vestibule by itself. Reminds me of the Octopus's Garden! Love it! Photos 9, 10, 11 and 12 are in a full-room installation of those fanciful, marine shapes and colors. It really does feel and look like diving on a reef. The very first Chihuly piece I saw was the ceiling in the lobby at the Bellagio in Las Vegas a few years ago. But I didn't know at the time who had created that amazing glass ceiling. Then last year, I discovered some Chihuly pieces when I was doing research for a blog post, and I put 2 + 2 together and realized HE had created that amazing glass ceiling!! His work is absolutely mesmerizing. The glass is so intricate and unique and free.... absolutely amazing pieces of art.